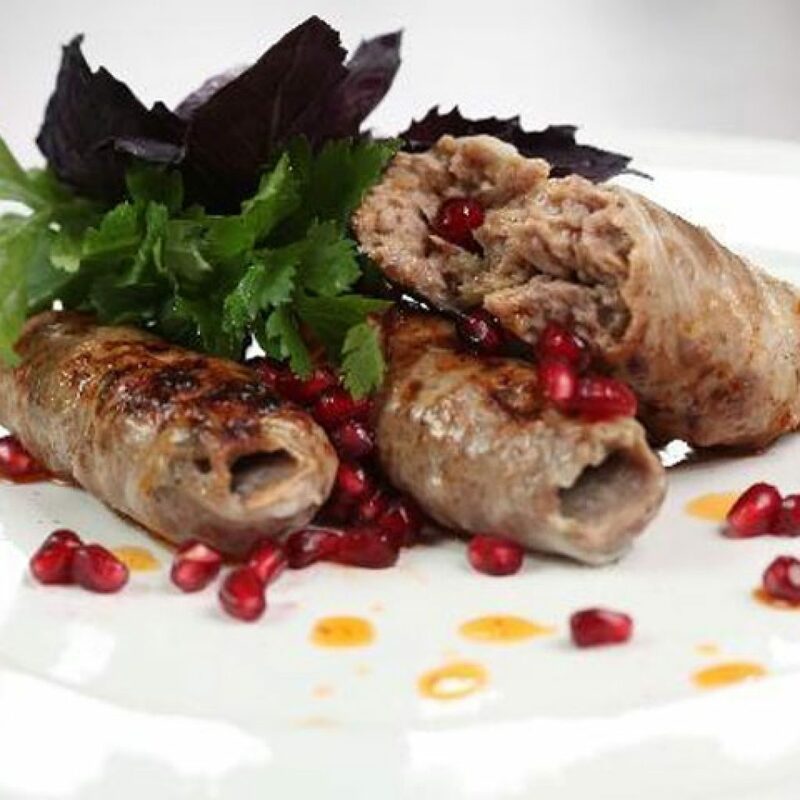 Georgian Cuisine is one of the richest and delicious cookery in the world. 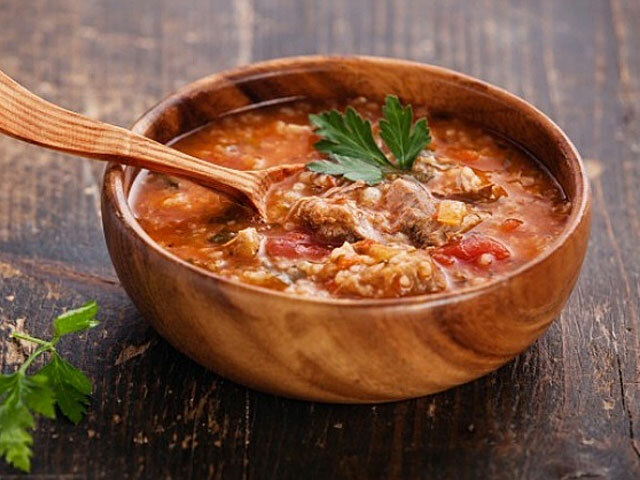 There is a noticeable difference between the regional cuisines of the country. 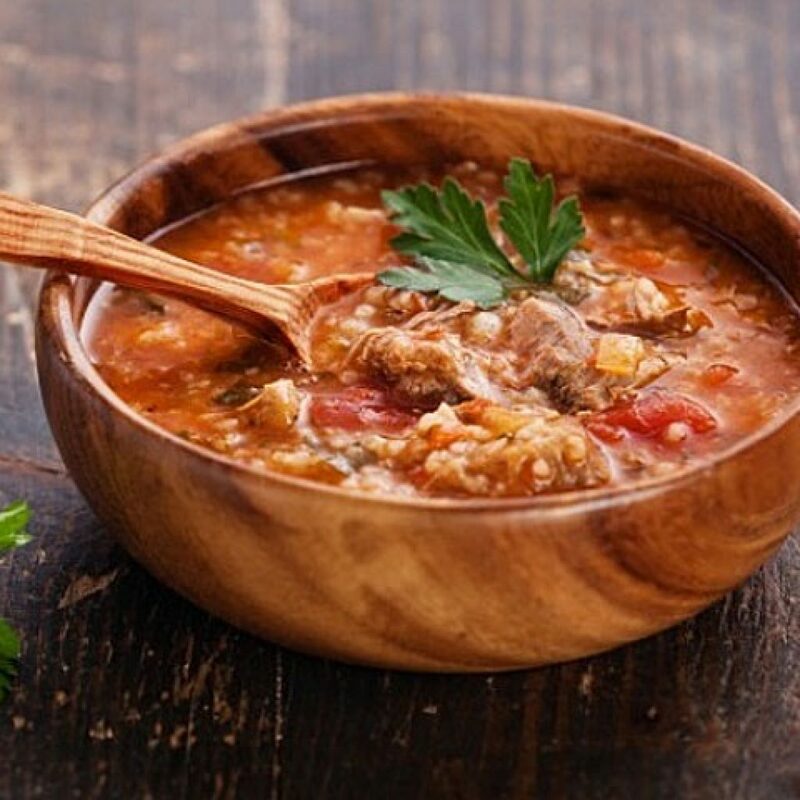 In the cuisine of eastern Georgia meat courses prevail; dominative is wine, bakery foods and excessive animal fats, while the cuisine of western Georgia is famed for the use of nut and pepper sauces, greens and variety of milk products. Georgia is a homeland of wine. Vineyards are almost everywhere. Georgian wine is made by special technology – they are fermented in Kvevri (clay vessel for wine), which gives unusual taste and delicate flavor to the drink. 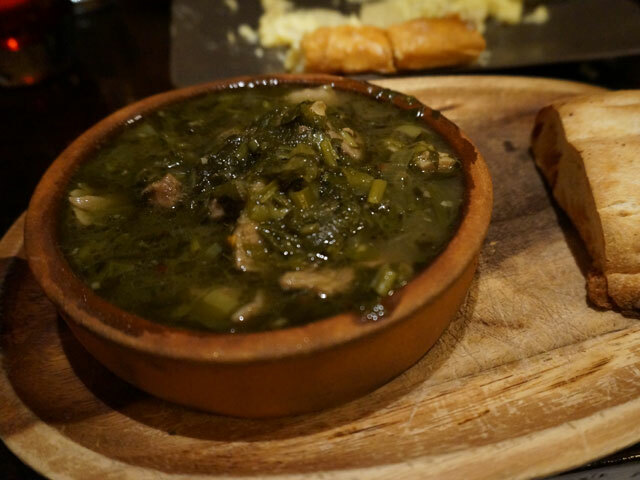 Chakapuli is the traditional dish in eastern Georgia; it is generally prepared in spring immediately following the Great Lent. 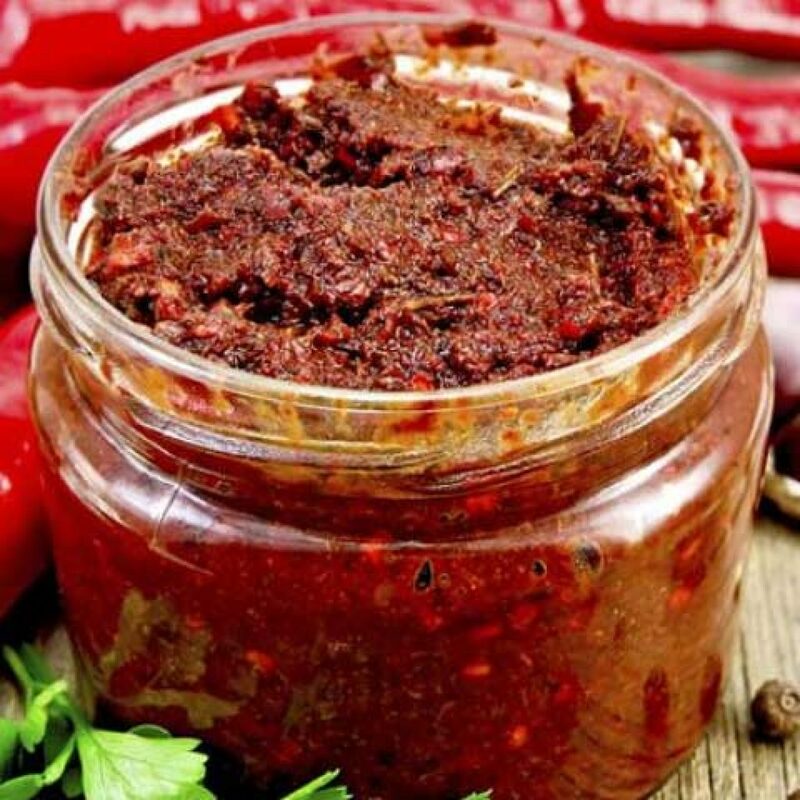 Exactly at that time estragon and fresh tkemali – common ingredients for Chakapuli – get ripe. 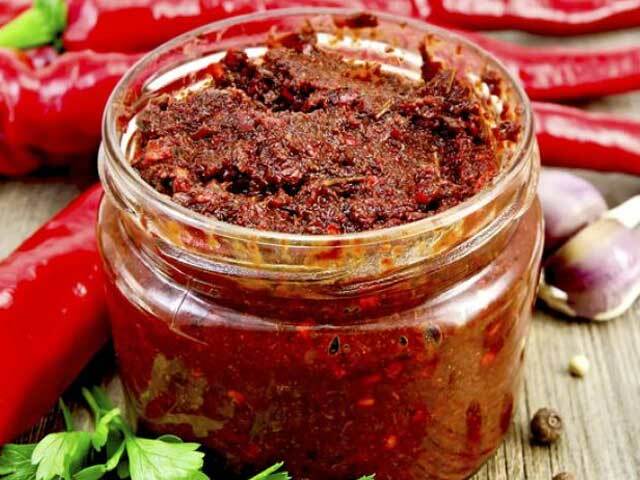 Shkmeruli is a dish made in Racha. Its name originates from Shkmeri village in Racha. 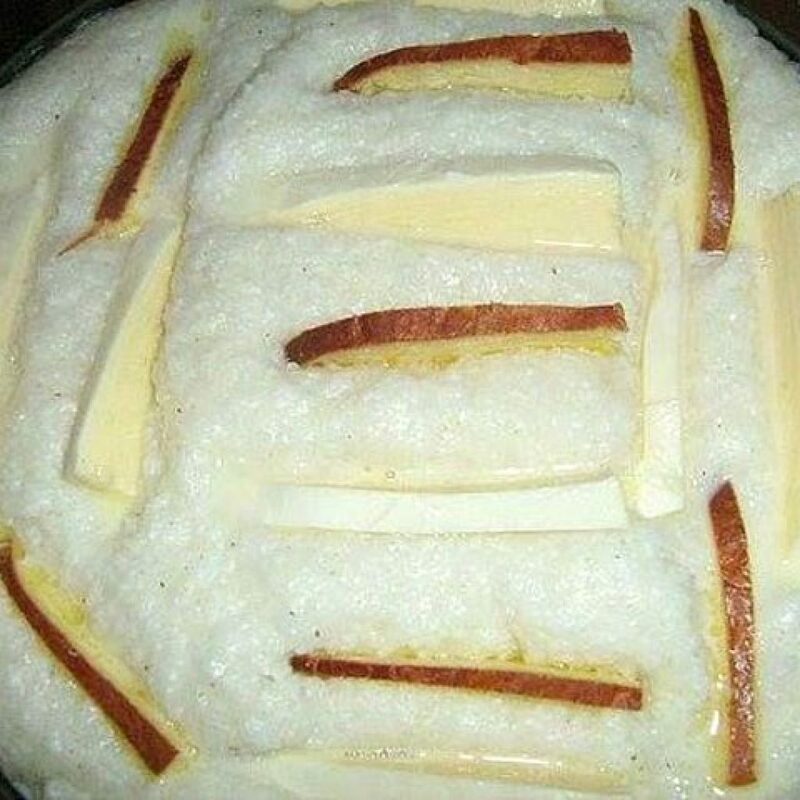 It’s a very popular dish throughout Georgia. 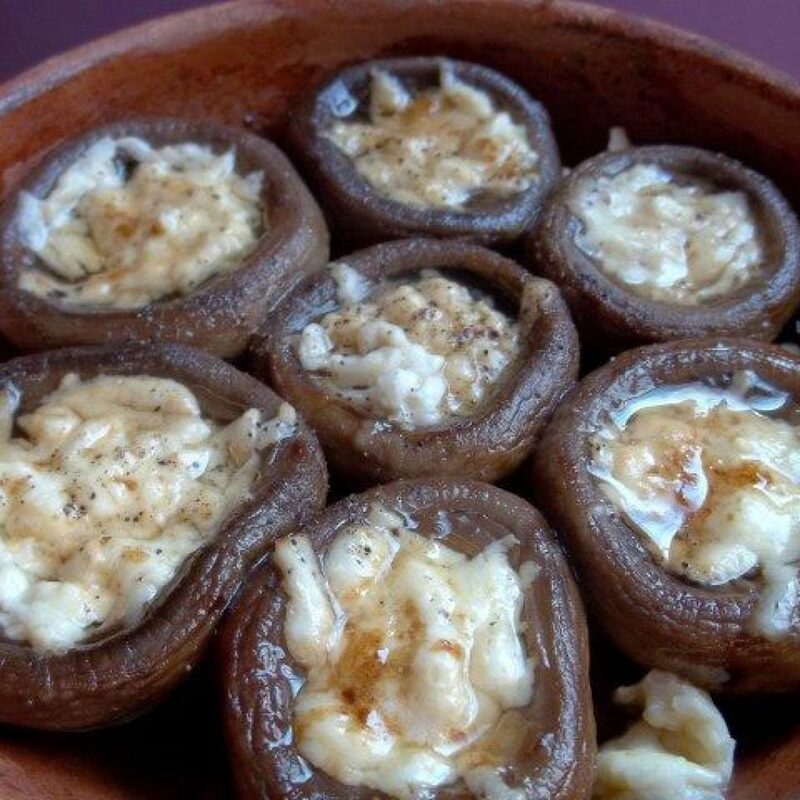 Shkmeruli is prepared on ketsi by adding milk and garlic. 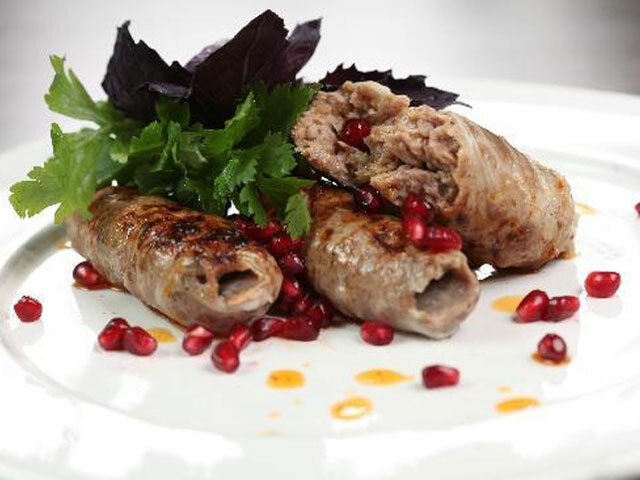 Chikhirtma is an eastern Georgian dish. 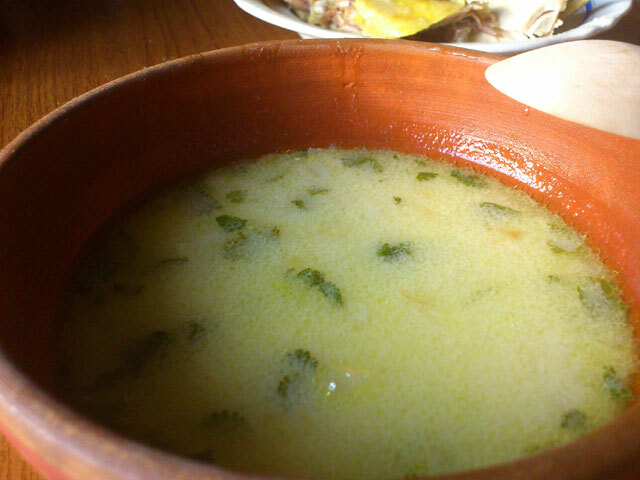 To chicken broth is added a mixture of egg yolks, wheat flour, spices, vinegar and sauteed onion. 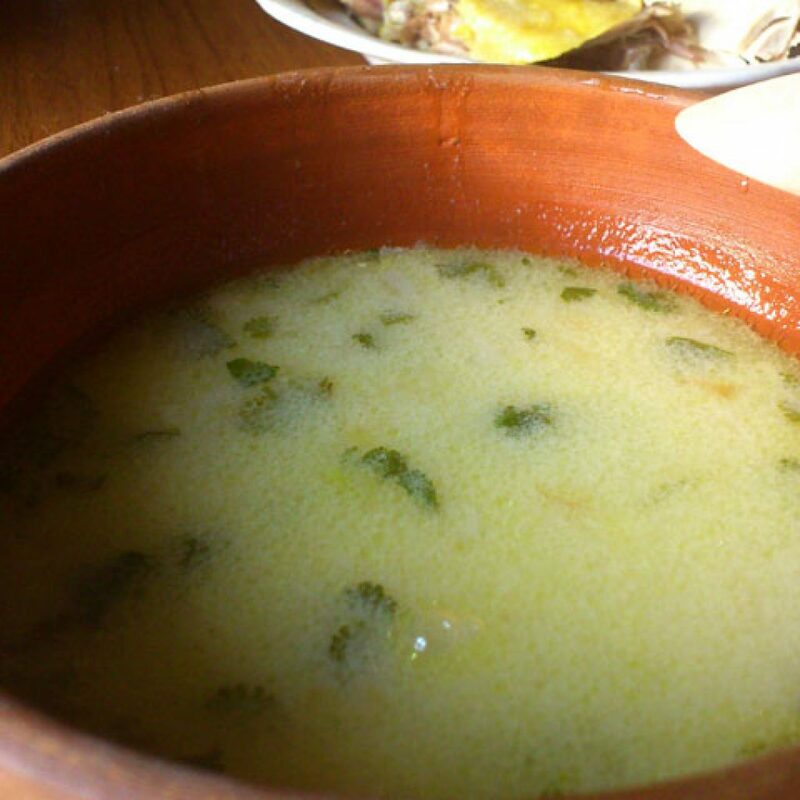 The soup has a sourish, pleasant taste and creamy consistency. 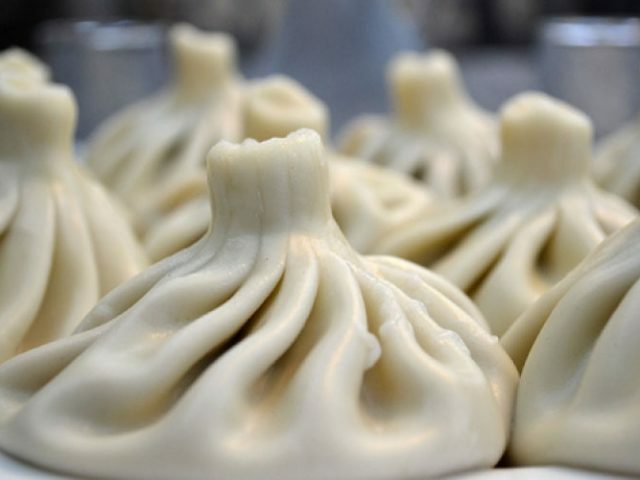 When talking about culture and traditions of mountainous regions, one simply cannot avoid their cuisine, which by itself represents an outstanding phenomenon of Georgian reality. 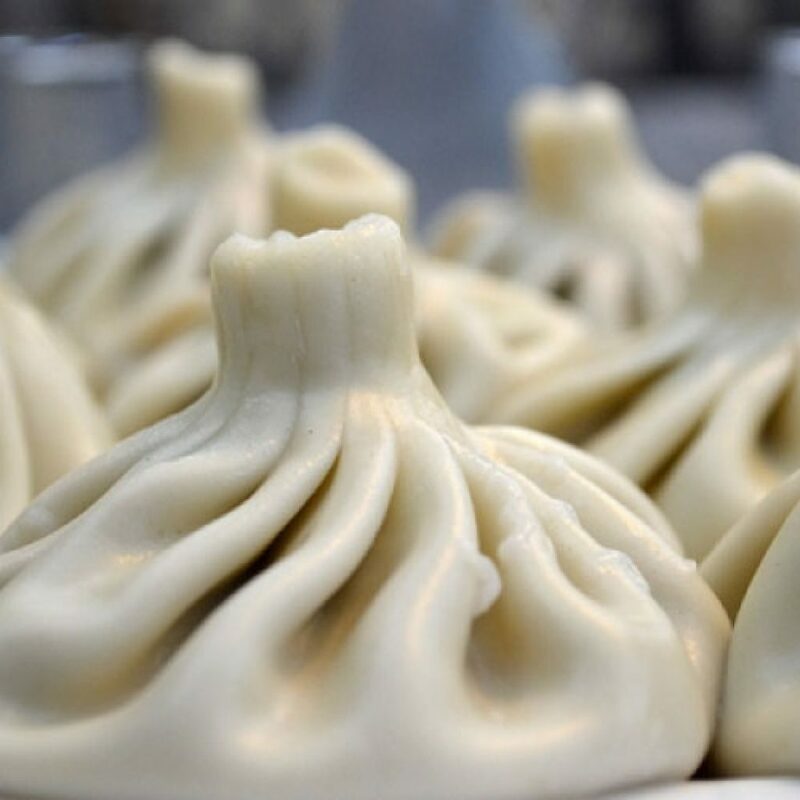 It is quite safe to say that the most prominent part of this phenomenon is Khinkali, which crossed the borders of the mountainous regions long ago and now occupies a place among the most colorful Georgian dishes. Whether Khinkali has Pshav or Khevsurian roots is very difficult to determine, but everybody agrees that it was originally a part of eastern Georgian mountainous culture that spread throughout the entire country over time. 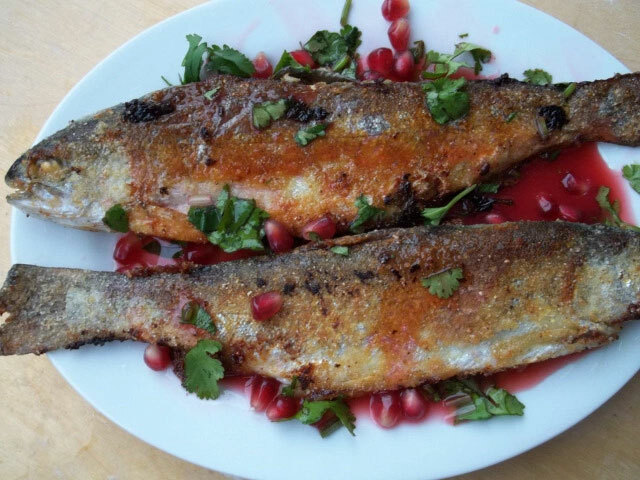 Trout is one of the main delicacies of Rachian cuisine. This regions lakes and rivers used to be abundant in red-dotted trout, with black and orange-dotted trout also present. Generally, trout prefers cold, clear, oxygen-rich water. It grows bigger in lakes than in rivers. Accordingly, Racha is one of the best regions for trout. 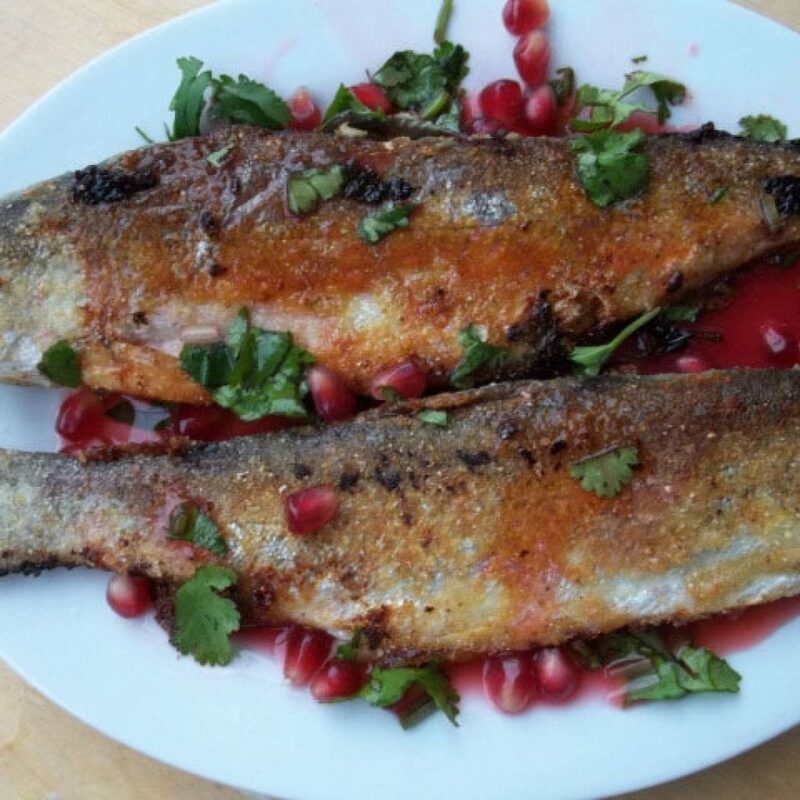 The most delicious trout is currently found in Rioni, Lekhuni, Krikhuli and Kheori rivers. People of Racha have various ways of preparing it. Sometimes it is fried on a ketsi (clay pan), sometimes it is spit-roasted and sometimes boiled. 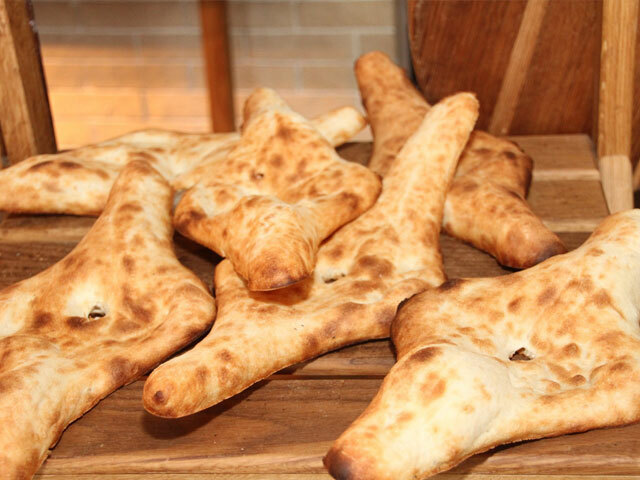 Shoti is a type of Georgian bread that has an oblong, crescent-like shape. 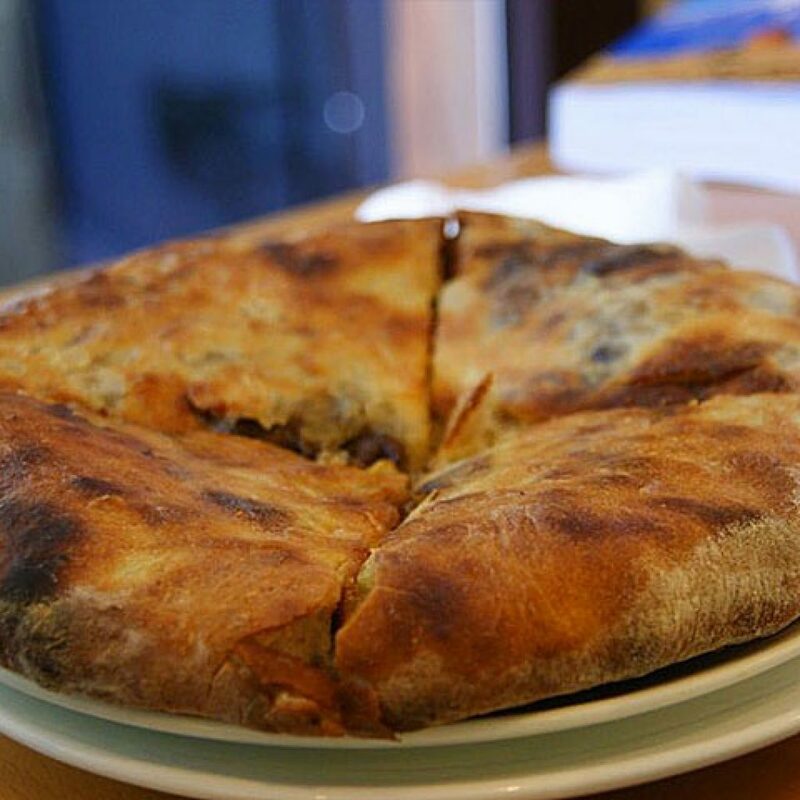 This type of bread is typical for the Kakheti region, but it can also be bound in the neighboring Kartli. The name “shoti” most likely goes back to pagan times and is connected to the moon, which was one of the principal deities. 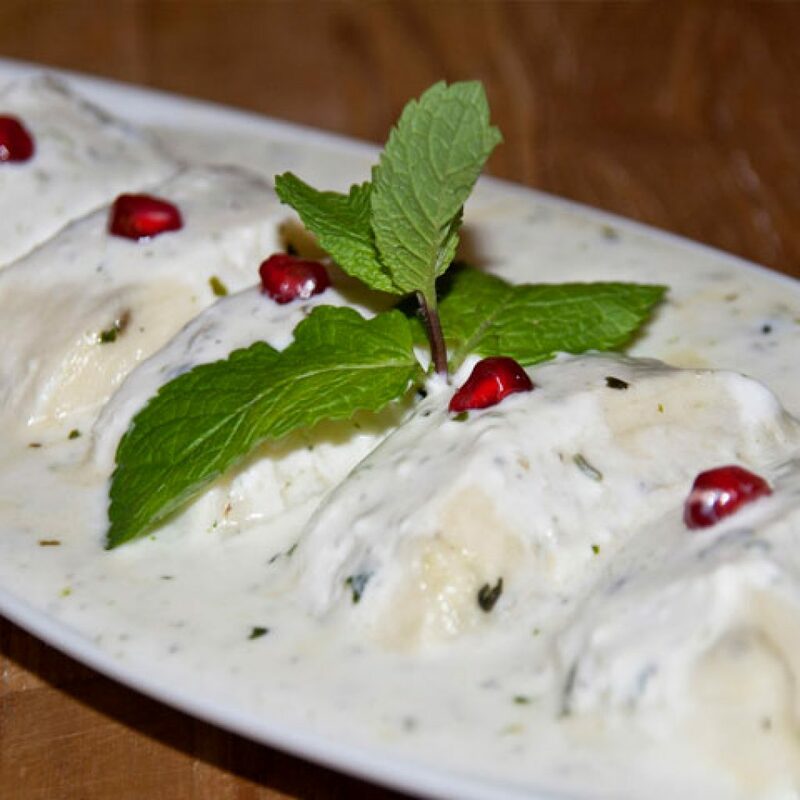 According to the old historical sources, shotis were used during feasts or religious holidays. 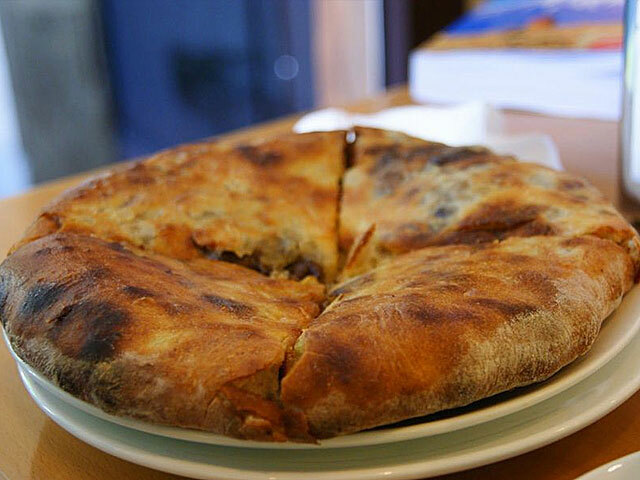 In Kakheti, shoti is also called “dedas puri”, which literally means “mother′s bread”. 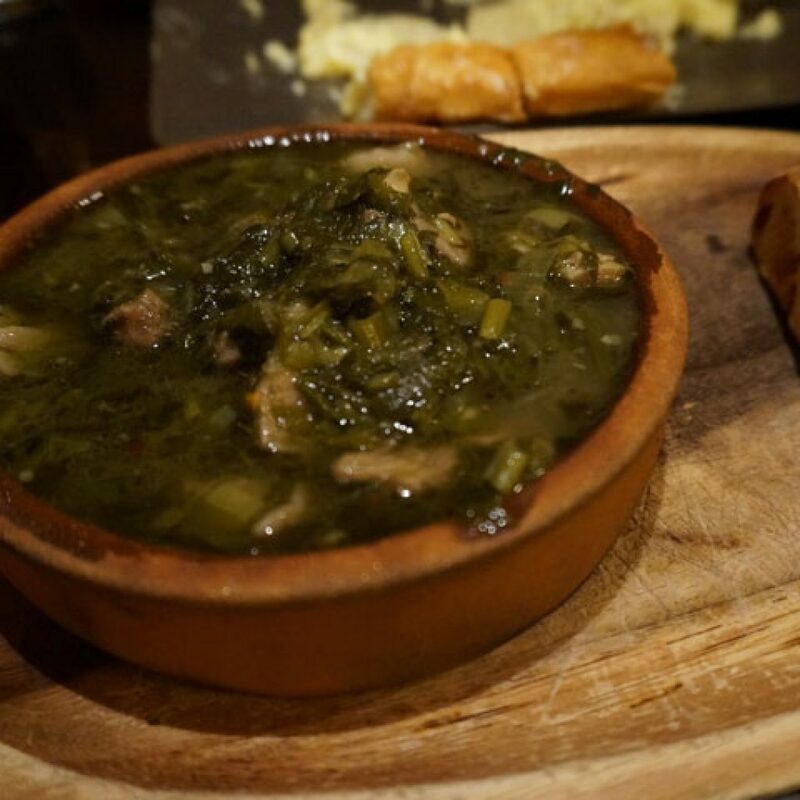 Kubdari is a pie, prepared of chopped meat, which is traditionally cooked in Svaneti. 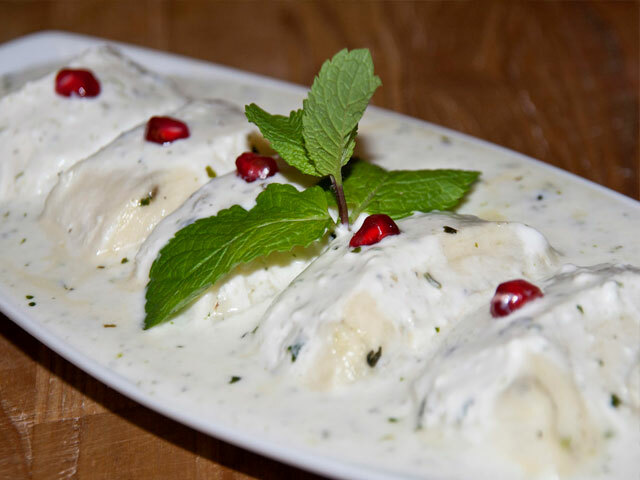 Kubdari, seasoned with plenty of spices is baked in the oven or on the pan. 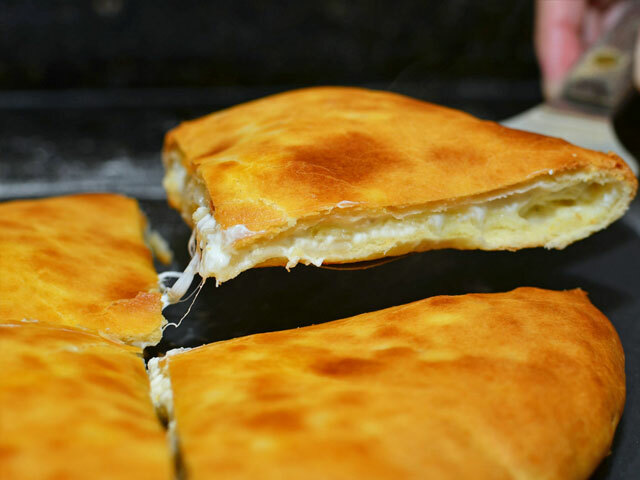 Khachapuri is khachapuri. 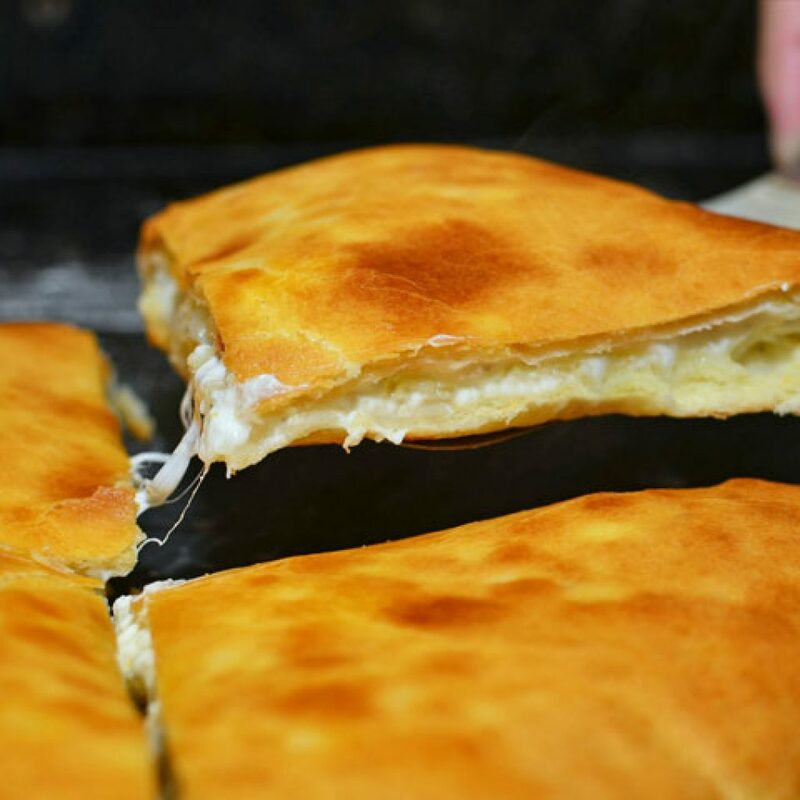 There is nothing more to say except that there is a few different types of khachapuri (Imeretian, Megrelian, Gurian, etc.) and the Adzharian one is probably the best thing that can happen with you in Georgia. 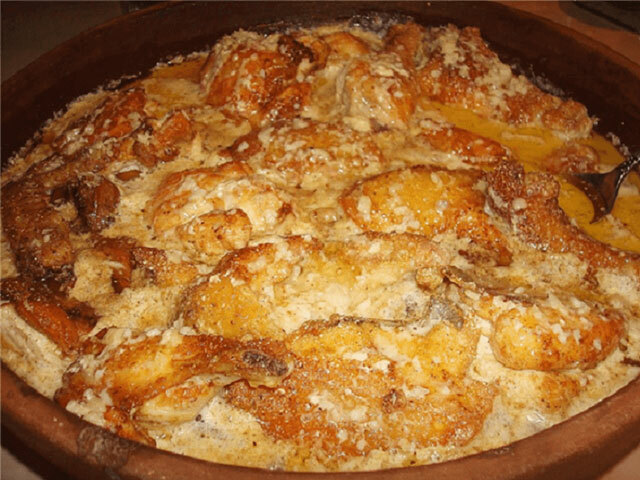 Satsivi is a west Georgian dish. It is a favorite New Year treat. 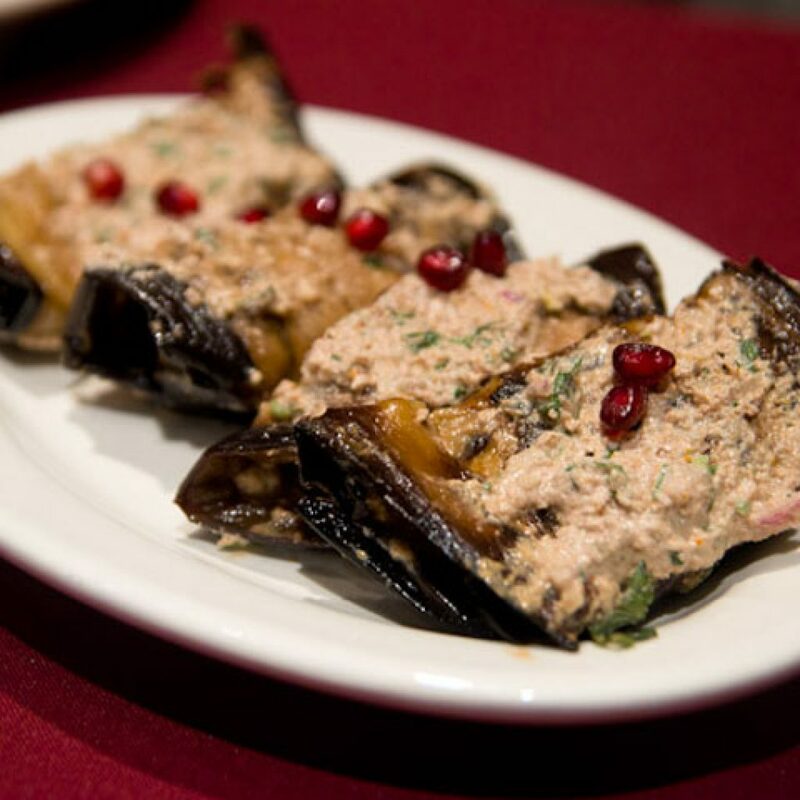 This dish, seasoned with walnuts and species is delicious and stands out by its aroma and taste. 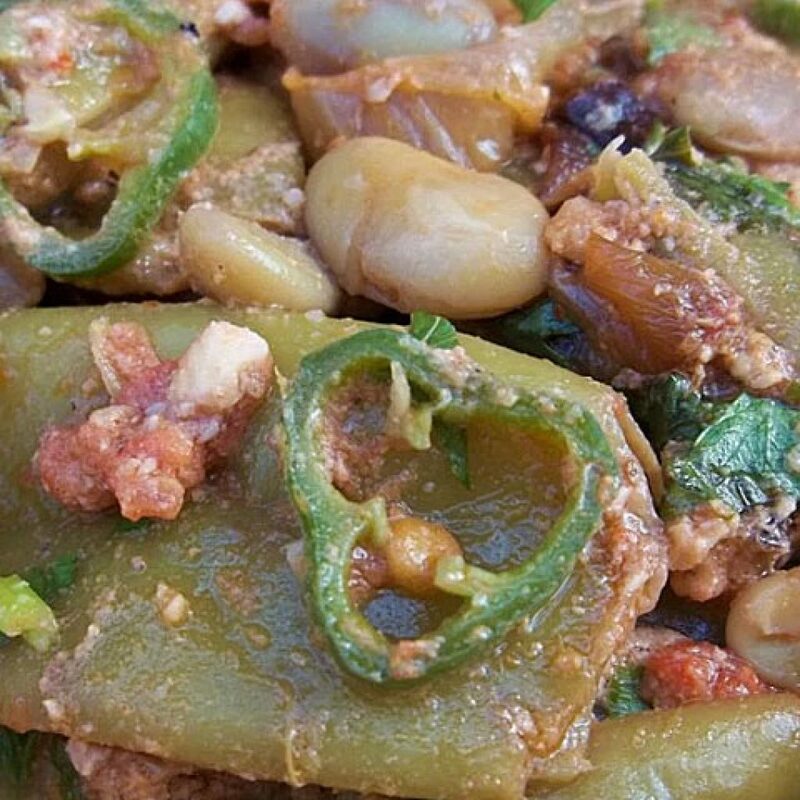 Eggplant with walnuts is one of the most popular dishes in Georgia. There are its various recipes. Walnut mass is a dressing for fried, boiled or baked eggplants. 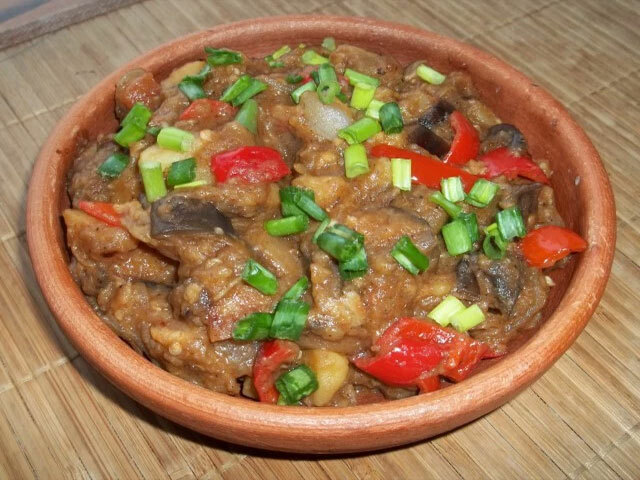 Ajapsandali is a summer dish made of from stewed vegetables. There are several ways of preparing Ajapsandali in Georgia. 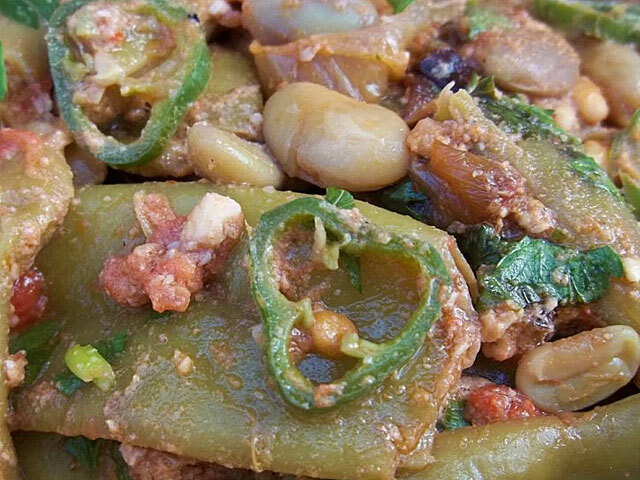 Unchangeable ingredients of Ajapsandali are eggplant, tomatoes and pepper. 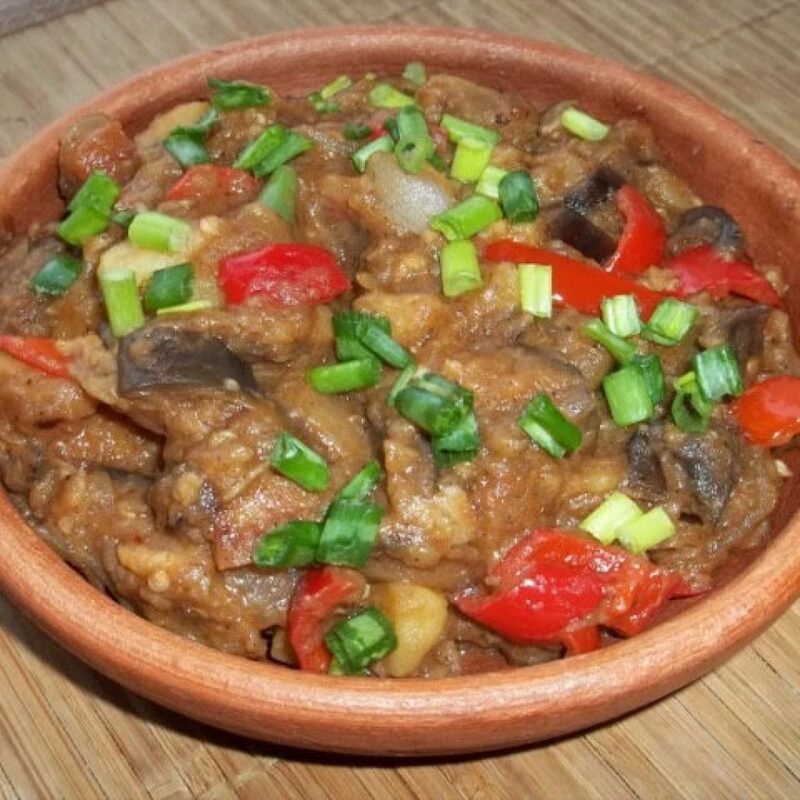 like many other dishes stewed mushrooms are cooked on ketsi, by adding of onions and fresh greens. 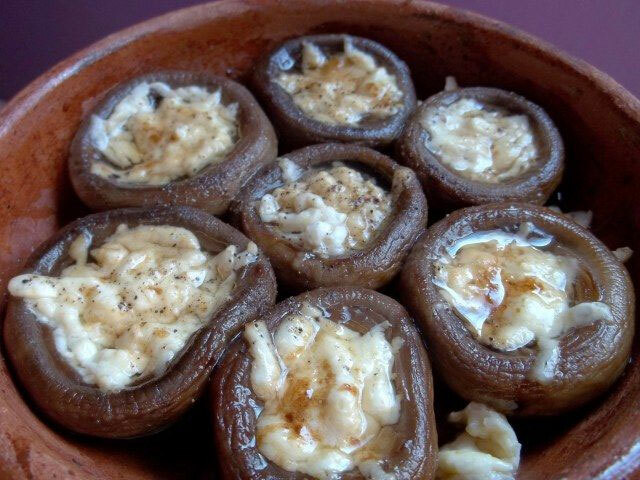 Mushrooms are common in Racha and Imereti. 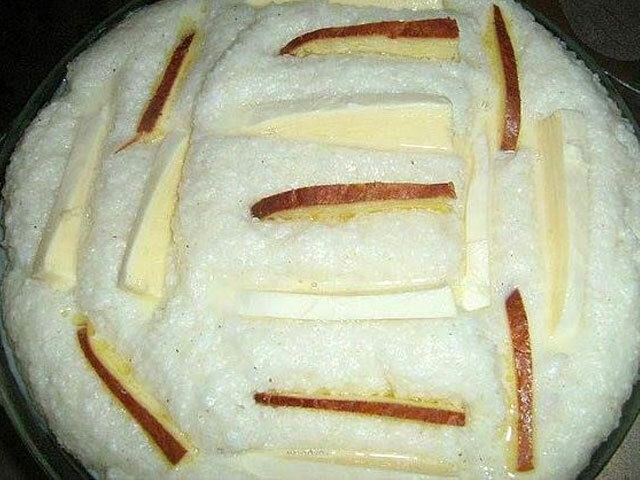 Ghomi is cooced from cornmeal and serves as bread for western Georgians. 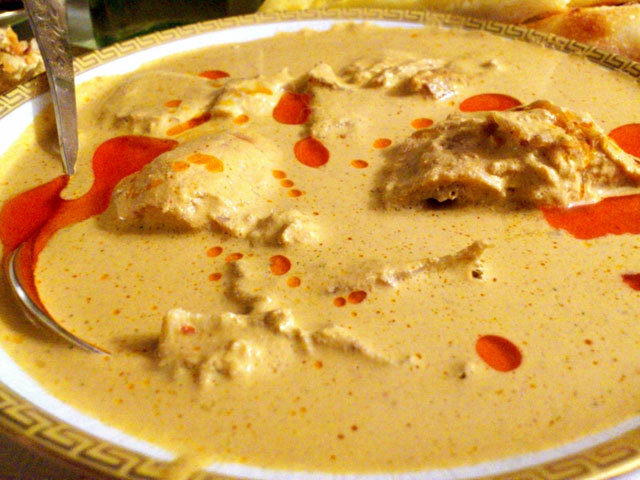 It is consumed with Cheese, Bazhe, Satsivi, fried fish and meat. 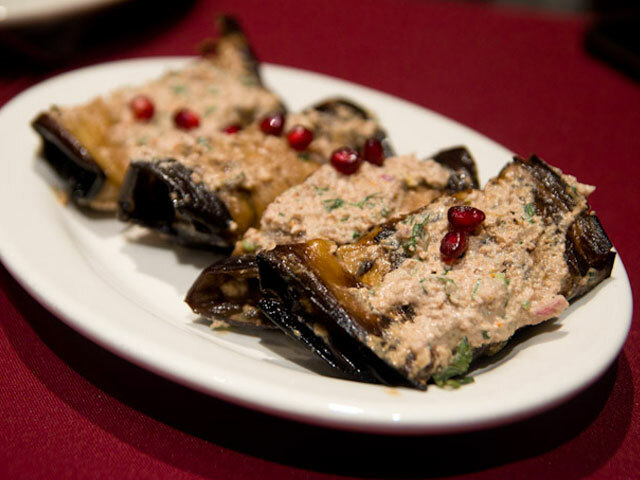 Abkhazura is rolled in caul fat, seasoned with spices and fried on pan or ketsi. Serve Abkhazura hot. 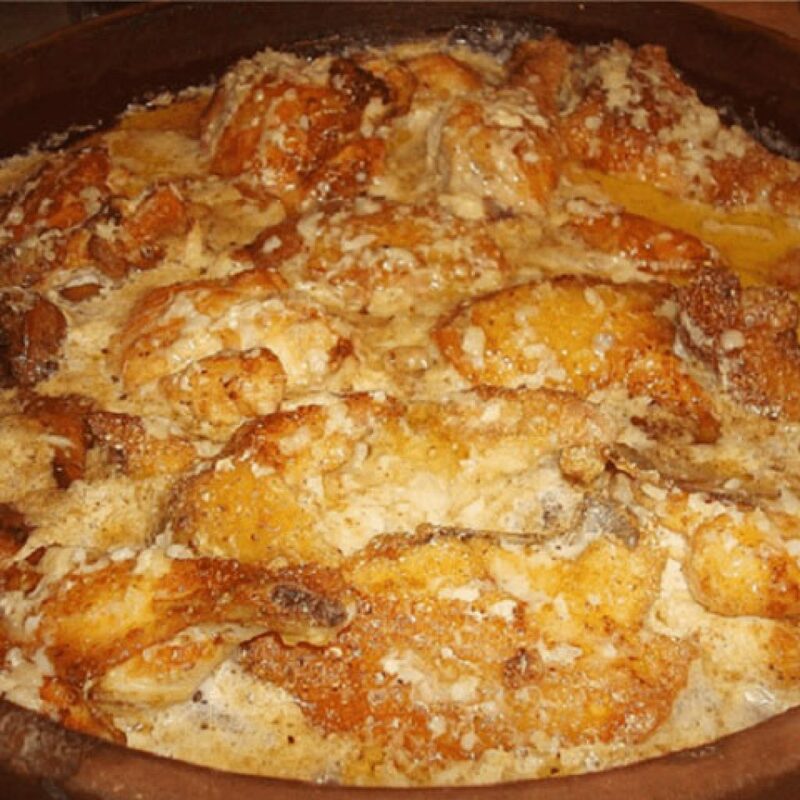 Gebzhalia is a Megrelian dish, which is prepared of cheese and curd cheese. As a rule, they eat it with Ghomi. Gebzhalia has strong smell of mint. 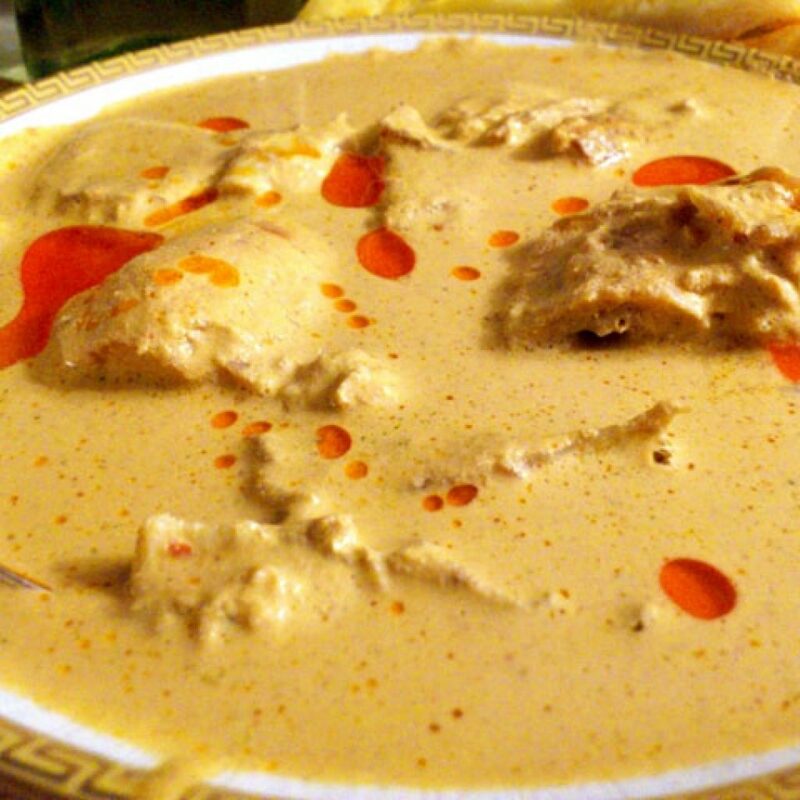 Walnut Kharcho is a Megrelian dish which is very popular in western Georgia. It is eaten with Ghomi, Mchadi and Elarji. Green Beans is a part of summer menu. This dish cooked with tomatoes and potatoes reminds Ajapsandali, but it has its own flavor. 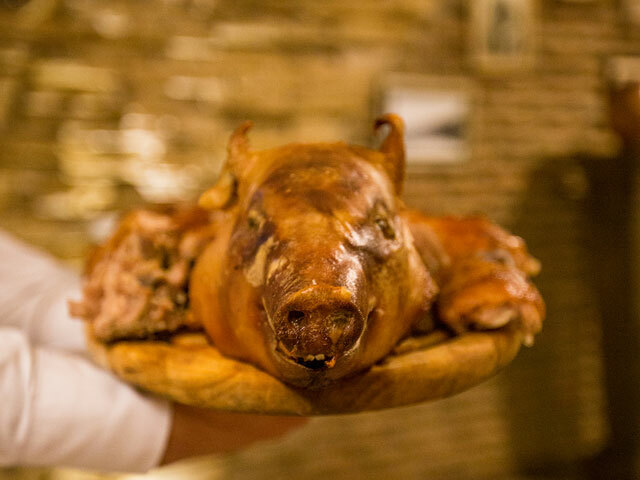 Roasted pig is a festive dish. 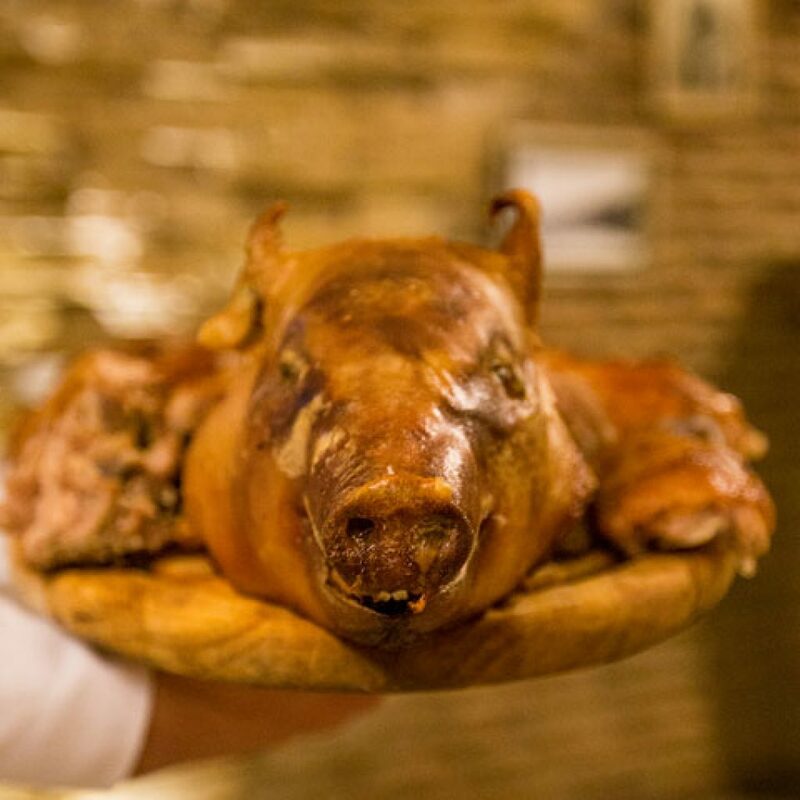 It is dressed with Ajika and other spices and roasted in the oven or on the spit. 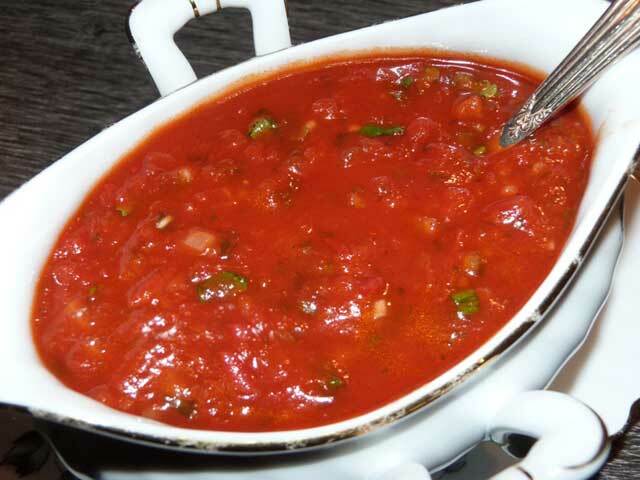 Tkemali is one of the most popular sauces. 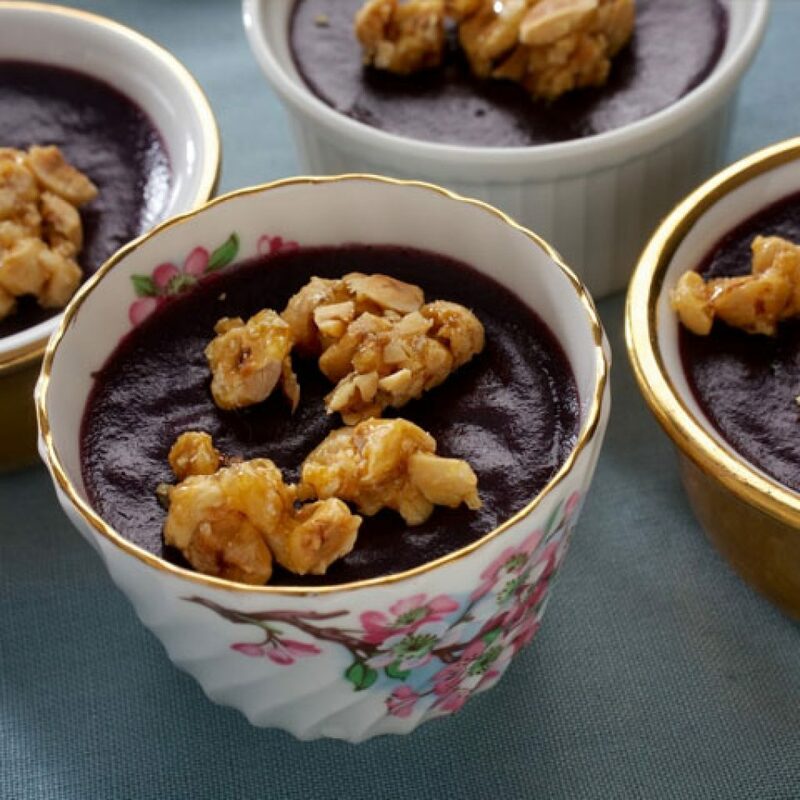 It is made of Tkemali – sort of a wild plum. Garlic, pepper and various greens are added to it. 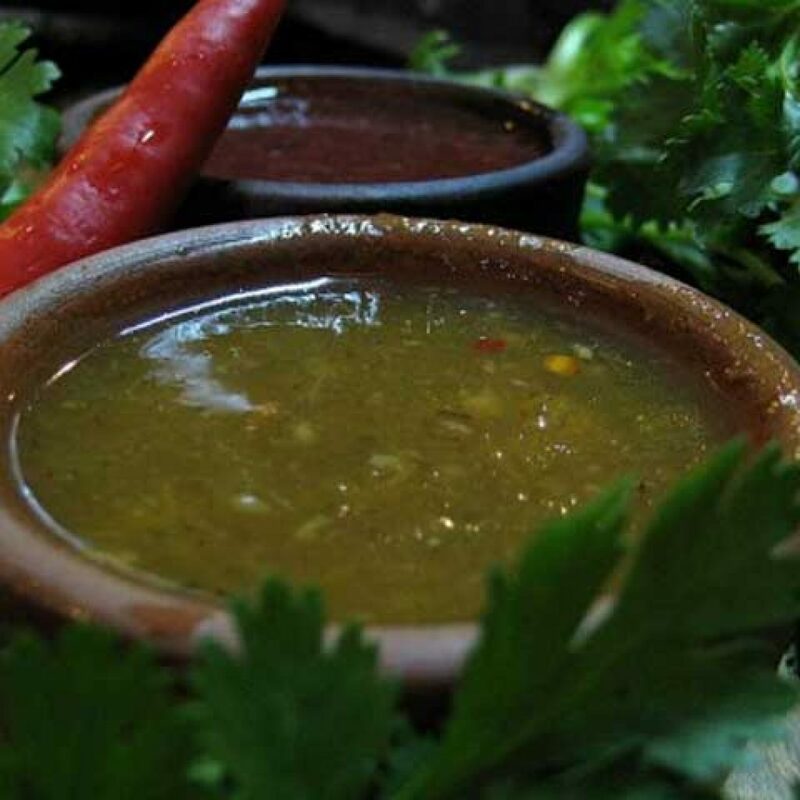 This sauce is also made of different sorts of berries, unripe grapes and various kinds of plumps. 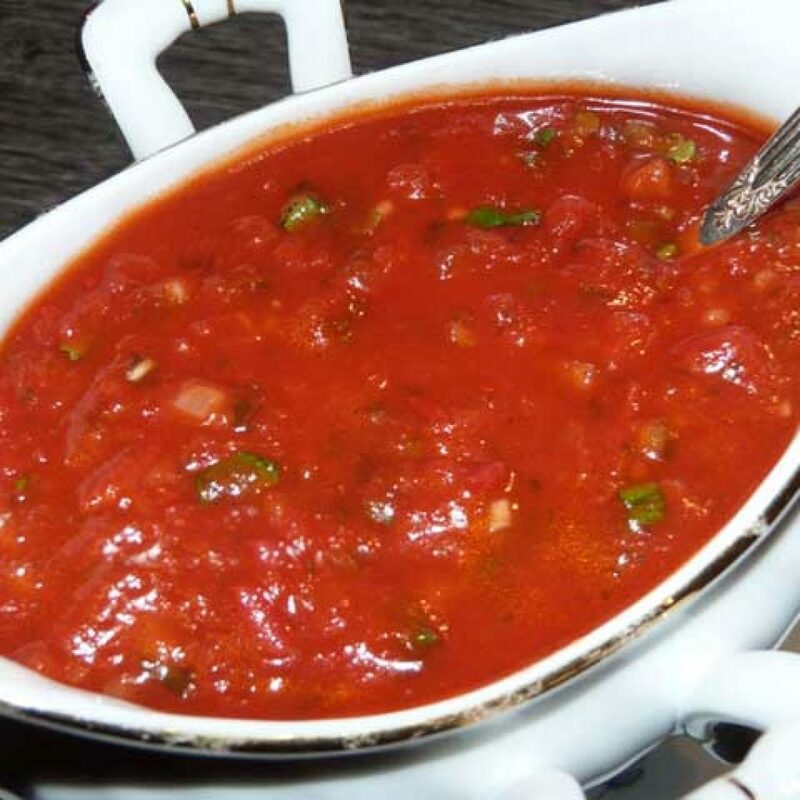 Georgian sauce, prepared on the basis of tomato, nuts and fruits. 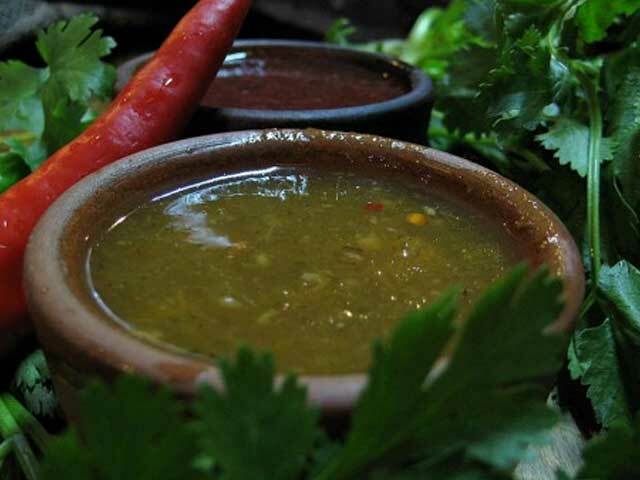 This sauce is served to fried or boiled poultry – chicken, turkey, etc. 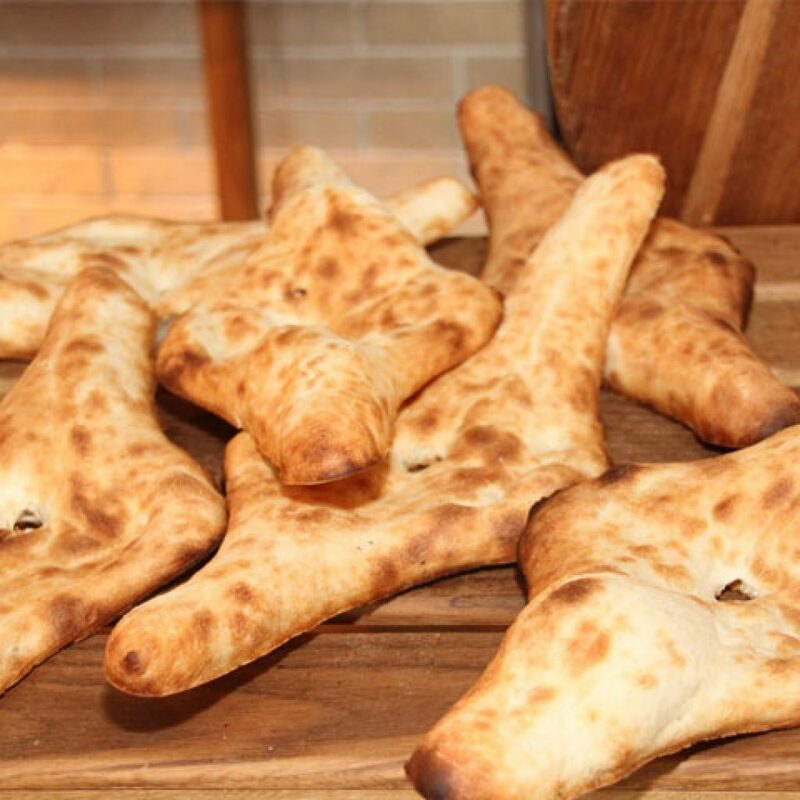 Adjika – Georgian spicy seasoning in the form of pasty mass, which includes red pepper with salt, garlic, green and dried herbs, fenugreek, etc. Adjika usually is red, but a green seasoning can be made from unripe pepper. 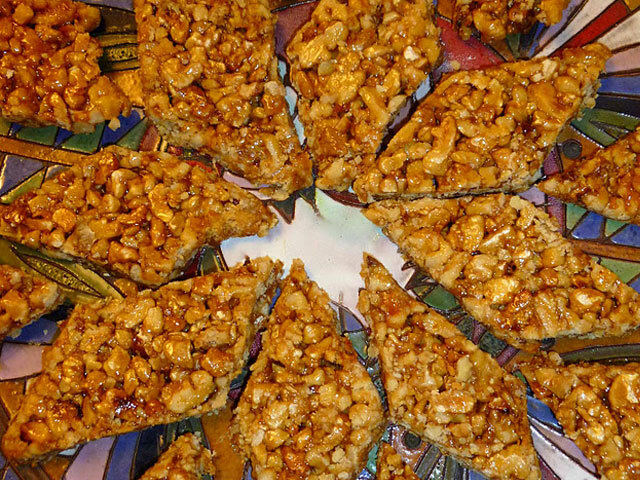 Gozinaki is made of walnuts and boiled honey. 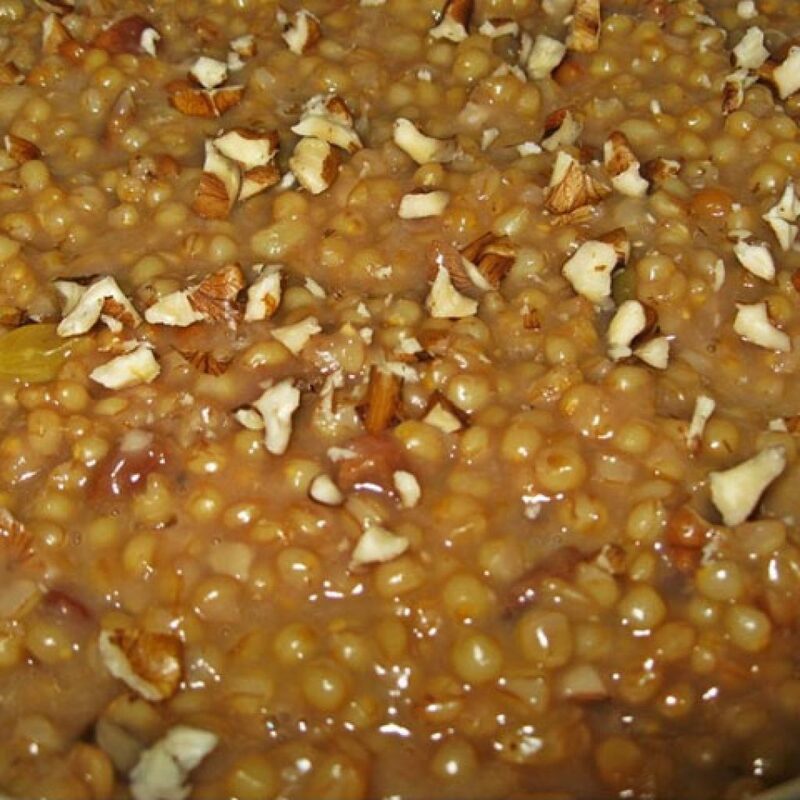 It is most popular sweet in Georgia, which is traditionally prepared only for the New Year. 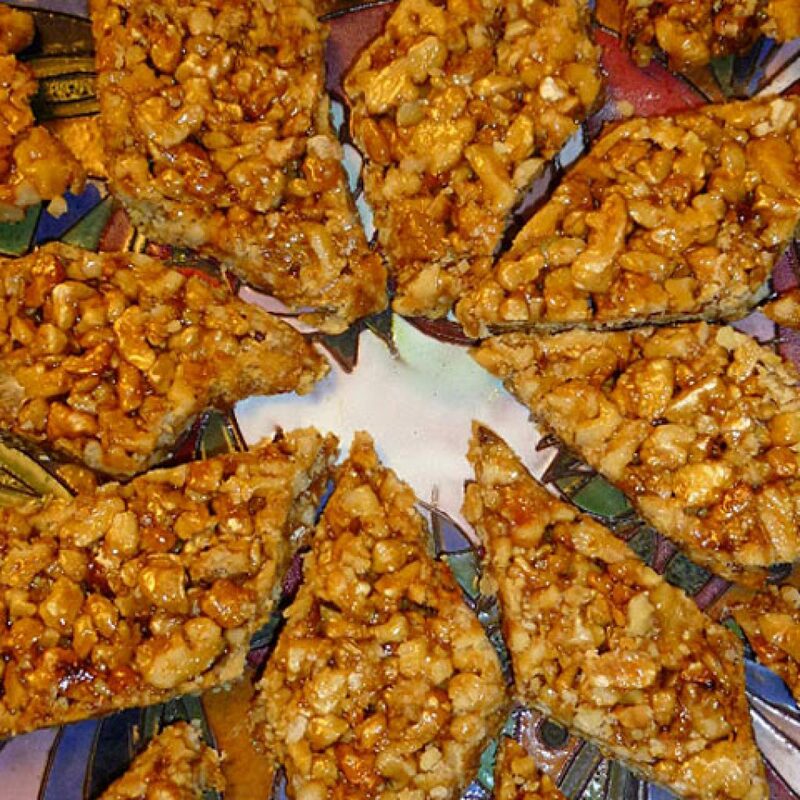 You can use almonds instead of walnuts. 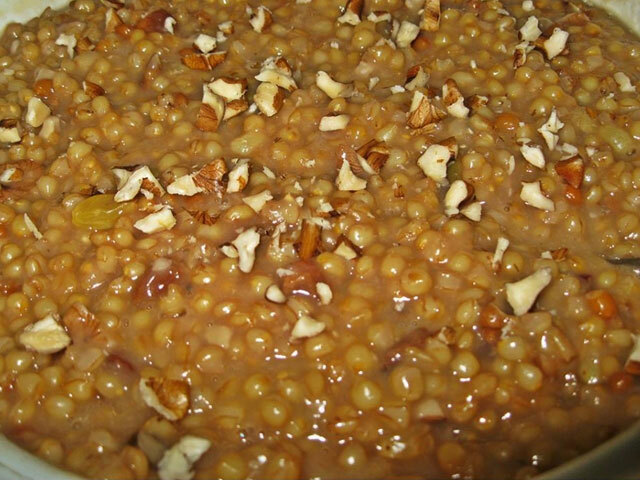 Tsandili is prepared with cereals seasoned with rains and walnuts. It is a ritual dish. In our recipe, we added honey, dried apricot and white cherry jam to Tsandili. 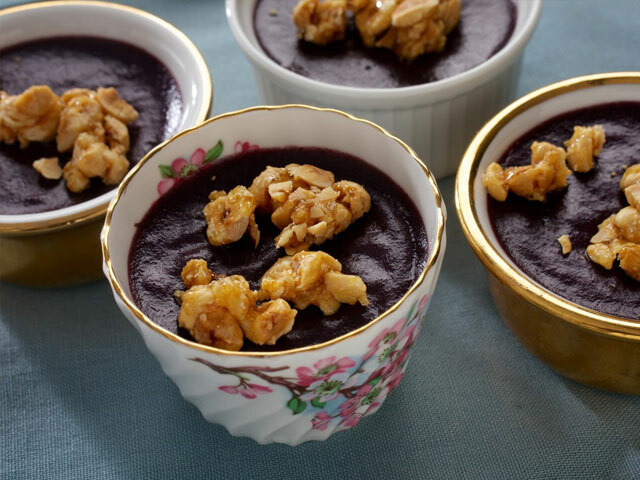 Pelamushi is a dessert, which is made of condensed grape juice and corn flour. In eastern Georgia, Tatara is made of Badagi and wheat flour. Pelamushi is prepared mostly in western Georgia.